Jake Chessum of Rolling Stone has written a feature story on Ozzy Osbourne. Portions of the column appear below. 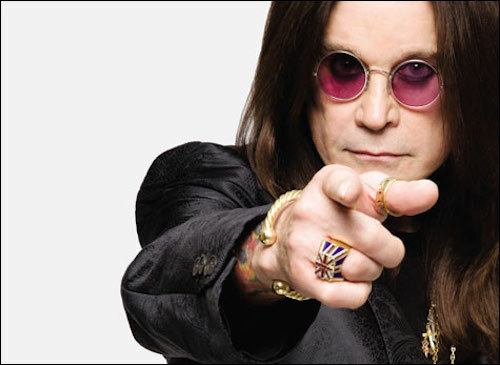 …For the past 50 years, Ozzy Osbourne has been heavy rock’s MVP. He gave metal a sense of menace during his first 10-year tour of duty with Black Sabbath, approximating the sound of a nervous breakdown on songs like Paranoid and Iron Man. Then as a solo artist, he redefined the genre in the Eighties, picking up the pace of his songs and injecting them with baroque noir. He introduced the world to a pantheon of guitar heroes, including Randy Rhoads, Jake E. Lee and his longtime foil, the blond-maned dynamo Zakk Wylde. He became a concert draw and provided crucial stages for everyone from Metallica to Korn in their infancies. In the mid-Nineties, he concocted Ozzfest, hard rock’s answer to Lollapalooza. And he’s reaped the rewards. All but two of his studio albums — which contain anthems like Crazy Train, Flying High Again and Shot in the Dark — have been certified gold or platinum, and he’s won a Grammy for I Don’t Want to Change the World. When Rolling Stone picked the 100 Greatest Metal Albums of All Time in 2017, the list contained more recordings by Ozzy than any other artist. And don’t forget, he was able to translate his success into reality-TV megastardom on The Osbournes. Read the entire article at Rolling Stone. By the way, I have a 70’s BC Rich Mockingbird that’s worth some money even though the original owner put a dang Kahler on the thing. Ozzy is a phenomenal artist, great singer, one of the best…those melodies were his and they were brilliant…he can’t write words and is not proficient on an instrument except for harmonica I guess, he fiddles on the keyboard….but he’s got something so special that only the best musicians should work with him…he’s one of the best entertainers to ever work the stage. I agree, Shannon. Ozzy is indeed a great entertainer. But I respectfully disagree with you about his singing ability. Mockingbirds are great guitars! You’ve got a great one there! I used to want one cuz I thought the body shape was awesome! Bummer about the tremolo, though. You still playing it? I’ve got the Les Paul I mentioned, a Jackson Rhoads, a Jackson Kelly, a Gibson Explorer, and a Gibson Flying V.
Nice…no, it’s sitting in the storage closet, it needs a re-set and I haven’t touched it in years….I used it exclusively when I did a Sabbath tribute gig for 3 years from ’97-’00; I stopped doing that because of the realization that that applause wasn’t for me really, it was for Tony and Sabbath, so it ended up being a lose-lose situation….I would play a great show and then get depressed about it..lol…so I just do my own stuff and it’s pretty good but no one cares…lol…which is kind of a bummer but I’ll take that over being in a cover/tribute band any day with all of the money, “fame” and whatever else that comes with it…impostors! I can’t even go to any of those types of shows. But back to the subject at hand…Ozzy can emote Rattlehead, he emotes like no I’ve ever heard and I can really relate to him…..he is on the level of his audience but he is also someone who couldn’t do any other job but the one he has…there is no other vocation for someone like him…I could do other things besides music and so could a lot of rock “stars” now……Ozzy sure as hell can’t. Rattlehead, I got a Michael Angelo Batio iV with a Floyd Rose, a really nice wide fretboard, nice elctronics, great paint job…for 300 bucks! You can’t not buy it…I mean, talk about bang for the buck I can’t think any better value anywhere than this axe…it plays great, stays in tune…I also have a Roland amp that you can input an iphone type thing so you can have backing music to play to…it has some effects, has a good sound, it’s really small…sits on my desk, I have a Fender Japnaese 1983 strat, but that’s it…I sold all my other gear. I just couldn’t not get that MAB IV for that price though. Rock on, Shannon! Thanks for sharing! That’s brand new! Batio is awesome in my book for putting that guitar out.